General Giap orders three regular divisions of the Viet Minh to march towards Laos. 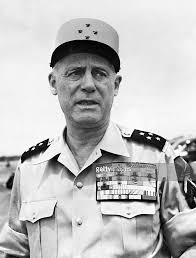 General Salan, the commander of the French Army in Indochina orders a French offensive to attack to the North West of Hanoi but it achieves little. General Salan orders that an outpost at Na Sam along the invasion route of the Viet Minh towards Laos be reinforced. Attempts by the Viet Minh to take the outpost are defeated. The Viet Minh invasion of Laos is ended when the rainy season arrives. A biography of General Salan.